Our Descriptosaurus Time Machine competition provides pupils with a great opportunity for to expand and experiment with descriptive language, develop their ability to add more depth and colour to their writing. It also offers cross curricular links, particularly with history, and the opportunity for pupils to research their chosen time period. 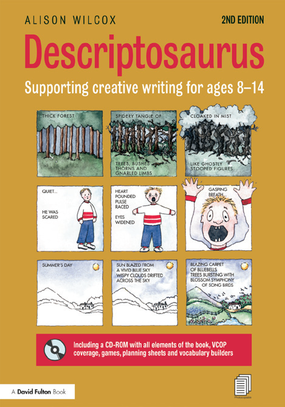 Encourage your pupils to expand and experiment with descriptive language using the Descriptosaurus books as inspiration. Pupils are motivated to create their own piece of descriptive writing set in a particular period of time – past, present or future. This poster outlines the challenge which could be displayed in the classroom. These resources were created in partnership with Routledge to promote the competition we ran in spring 2017.